← How Do I Know When to Bug out? For some people who have a bug out location already set up that is easy to get to, this may not be much of a problem. But unfortunately, most people don’t have a well stocked bug out location or the skills to live off the land without one. Most people will be dependent on what they take with them. This means the vast majority of people will become refugees. Granted maybe a better trained and equipped one, but still a refugee. So that brings up the question what do you take with you. My answer is as much as possible. If you are forced to leave, it will probably be on short notice so you will have to grab what you have ready and go. This brings up another issue, will you be leaving on foot or by vehicle. I start out with the assumption that I will have to leave on foot. This limits you to what you can carry or pull or push in a small wagon, bike or wheelbarrow. So the first thing you need is a good bug out bag. This is a bag that contains everything to keep you alive and well for several days, hopefully enough time for you to get to a place of safety. Here are some links to some older posts that will help you plan a bug out bag, ALICE, How much should your backpack weigh?, Japanese earthquake and seventy-two hour kits. In addition do a search of my site for bug out bags or seventy-two hour kits and you will find more information. Now if you can leave by vehicle you have additional options. You should plan and have a list of items that you can immediately grab and throw in the vehicle to supplement your bug out bag. In other words, I am suggesting a modular system. The first thing you put in the vehicle is your bug out bag and then depending on time constraints. You add addition items. Stored along with your bug out bag you should have a list of the addition items you would add to fill your vehicle. The list should also tell you the location of these items and they should already be packaged so they can be loaded quickly. This lets you be ready to leave in a very short time with maximum amount of useful items, including food and water. Sit down and make a written plan, discuss it with your family or any group you will want to join up with and set some rally points. I am always open to new ideas so don’t hesitate to make comments and suggestions. This entry was posted in bugging out, Seventy-two hour kits, Transportation, vehicles and tagged bug out. Bookmark the permalink. 2 Responses to If You Have to Bug Out, What do You take? I’ve told people to have a load plan and practice it. 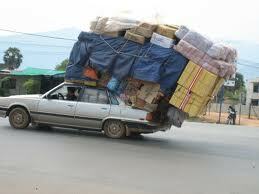 You select the items you want to bring and then load them on the vehicle. As you load them you add them to the sketch of your vehicle showing location and number it with a list that says what the number is. If it doesn’t fit the way you want to then back up and make necessary changes, remembering to change them on the sketch and list also. After you get it loaded and secured the way you want it, empty the vehicle completely and try it again going by the sketch and list. If done correctly it should get loaded correctly again. Then unload the vehicle, wait a couple months, and try it again using the sketch and list. If it doesn’t fit right then you need to make changes to your instructions on the load plan to make it more clear. Prioritize the items and pre-load them into containers if possible. Otherwise have the correct container handy for fast loading of items and then moving to the load area. Have separate load plans for each vehicle and trailer, don’t put them on the same sheet because it will cause problems when everyone is trying to load a different area at the same time. Also, post the load plan where it can be found quickly, like on a clip board hanging by the bug out bags.